As you may know, this sunday is Easter. Alas, Easter Egg hunts are mostly in the rear view for me now. My kids have gone though all the stages: the times when you don't even really hide the eggs, the times when you find them for the kids, the times when the olders have to be limited to a number of eggs so the littles have a chance, the times when the olders help the littles, the times when the olders hide the eggs for you. Now, there is just a sad bin of plastic eggs in the basement, probably with some candy still inside, that will stay there until I have grandchildren. Maybe when we visit my family during spring break, we might be able to squeeze out one more for my niece. She's in second grade, and is pretty wised up. She might not totally buy into the magic of it all, but I'm pretty sure she's still up for an activity that involves running around and candy. So, what Easter traditions remain with a houseful of teens? Well for one, there's egg dyeing. I would love to get those new eco-friendly egg dyeing kits I see at Whole Foods (not to mention their extremely charming naturally dyed eggs for hiding. I think they are made of hemp or something). 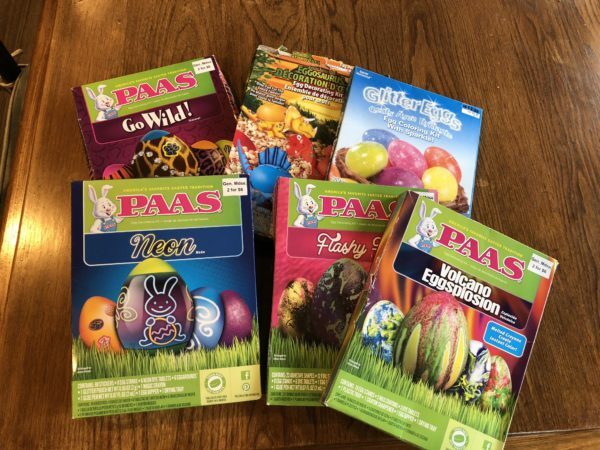 But somehow I got ahead of myself several years ago, and there are six separate Paas kits in my pantry (I think I may have gotten one for each kid for a few years and then slowly I'm only using one per year, like a sane person). So we'll just go with those. They are not Pinterest ready, but there is the nostalgia of carefully separating the perforated egg-sized holes in the box and then trying to put them back in and read the directions printed there. Other than that, over the years, the Easter Bunny has turned out to be kind of a freewheeling gift giver. Sure, there will be candy in those baskets Easter morning, but a lot of the stuff that the EB brings is also found at the drug store and is often just the impractical stuff Mom would never buy on a regular drug store run. One year is was and Ombre-at-Home hair dyeing kit. Another, a set of novelty lip balms. Video Games were popping up, but now that they are mostly downloaded, perhaps there is some sort of gift card for that that this bunny knows about. So, whatever your Easter traditions (if you even have any easter traditions) have a great weekend! If your kids are little, enjoy every moment, because it goes by in a flash. And have a Reeces Peanut Butter Egg (and maybe a mini chocolate bunny) for me.